Welcome to the new Holiday Inn Express and Suites New Cumberland; New Cumberland's newest and most modern hotel. We are conveniently located off I-83 and I-76; the PA turnpike. 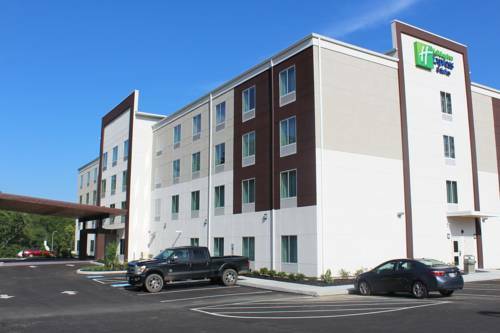 The new Holiday Inn Express and Suites is an ideal destination, just minutes from Downtown Harrisburg and the State Capitol, Carlisle Car Show, Gettysburg, and the PA Farm Show Complex. Guests with kids are happy to know that our hotel's site is near Hershey Park. After spending a day filling the children with candy, plan a day trip to Historic Gettysburg and explore the battlefields, monuments in one of our nation's historic places. Adults who are looking to ski can take a trip to Round Top in nearby York. The Holiday Inn Express and Suites New Cumberland is perfect for leisure and business travel. Dont forget to visit the Bass Pro Shop on Second St in Downtown Harrisburg. Business guests are glad to hear that major corporations like Rite Aid Corporation, Fed Ex Ground Services, Highmark, New Cumberland Army Depot and Naval Support Activity are just minutes away New Cumberland, PA visitors will only travel 11 miles to fly out of Harrisburg International Airport. End your day by enjoying all the comforts our Holiday Inn Express and Suites New Cumberland hotel provides; our Fitness Center, heated indoor pool and our Express Start Breakfast with our signature cinnamon rolls, pancakes, healthy choices like yogurt, sausage. Nicks takes pub grub and diner style staples like gyros, fried goodie baskets, and soups, and kick it up a few notches to something that does a pretty impressive job of holding its own, culinarily speaking. Dockside Willies was designed with the desire to serve gourmet Brick Oven Pizza, Creative Salads, 'Man Sized' Sandwiches, Fresh Baked Rolls, and delicious Dinner Entrees. Capital City Mall offers excellent shopping in the Camp Hill and Harrisburg area. Enjoy shopping at retailers that include Sears, JCPenney and Macy's. Take a self-guided tour of the Utz potato chip plant as you follow a glass-enclosed observation gallery. Smell the warm chips, get a free bag at the end. ~28 miles from New Cumberland. If you like horses, and you like 'em tiny, you'll like the Land of Little Horses. ~35 miles from New Cumberland.